Project site engineers and all civil engineers should be able to distinguish and identify good quality Q&T rebars. How does one ensure that the rebars have a concentric tempered martensite periphery with a softer ferrite-pearlite structure? A few guidelines are presented here. a. Ensure the mill that has supplied the rebars has a genuine ‘quenching & tempering’ technology. b. Check whether the Q & T technology supplied to the mill is by an authorised and competent organisation. c. Check the licence, if any, issued to the mill for the specific Q & T rebars. d. A Licence from B.I.S. is an added asset. e. Always test the rebars for properties instead of merely relying on the name ‘TMT’. f. Field test the rebars at random. The first thing to be done is filing the surface of the rebars with the help of workers ‘rough’ hand file. A site worker will easily recognise if the surface is hard or soft. All Q & T rebars have a harder surface than unquenched bars. g. Finally, random sample should be drawn. The cross-section is smoothened to a fine polished state by grinder and emery paper. The smooth end of sample is then pickled in nitrol solution (5 to10% nitric acid with balance ethyl alcohol). The result should show a uniform tempered martensite periphery with a softer core in case of good Q & T rebars. Generally, good Q & T rebars will have elongation from 16 to 28% depending on final yield strength. 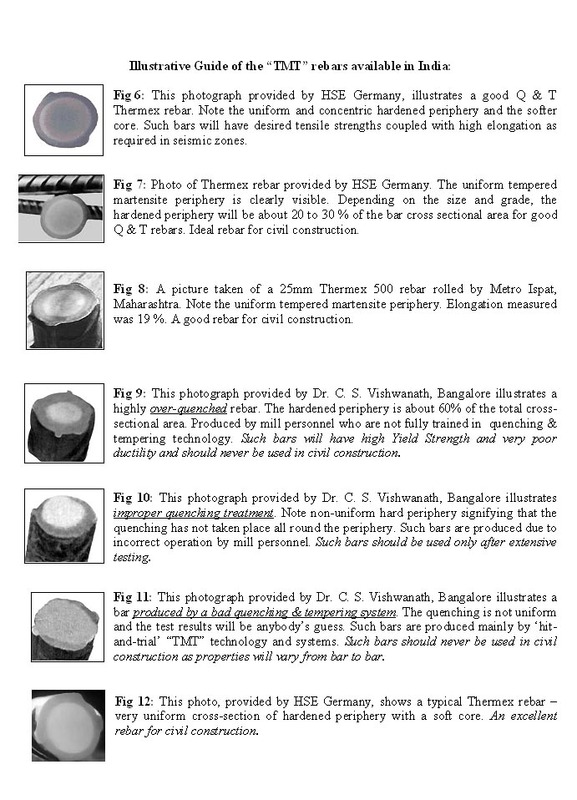 For the benefit of civil engineering fraternity an Illustrative Guide of the “TMT” rebars available in India of etched cross sections is presented through Fig 6 to 12. Besides photos received from various mills and HSE Germany, Dr. C. S. Vishwanath has kindly submitted some photographs of samples drawn and tested by his laboratory.. The explanatory notes alongside each illustration will serve as a good guide for a better understanding by the reader.